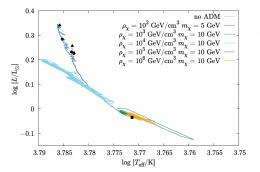 (PhysOrg.com) -- Finding evidence for dark matter  the unknown substance that theoretically makes up 23% of the universe  has been one of the biggest challenges in modern cosmology. Several experiments are underway to detect dark matter candidates known as Weakly Interacting Massive Particles (WIMPs) as they travel through the Earth. And experiments at the Large Hadron Collider (LHC) are trying to produce WIMPs through proton beam collisions. Now in a new study, scientists have shown that feebly annihilating dark matter particles captured inside a star can provide an additional source of energy to the star, resulting in changes to its structure and appearance. Observing these stars could potentially offer scientists a tool to detect and analyze this kind of dark matter. The scientists, Fabio Iocco who is currently at the Oskar Klein Center for CosmoParticle Physics in Stockholm; Marco Taoso, currently at the University of British Columbia in Vancouver; Florent Leclercq of the University of Paris and Ecole Polytechnique ParisTech in Palaiseau, France; and Georges Meynet of the University of Geneva in Sauverny, Switzerland, have published their study in a recent issue of Physical Review Letters. In their study, the researchers focused on a type of dark matter called asymmetric dark matter (ADM), which can be loosely categorized as WIMPs. Due to an asymmetry between ADM particles and their antiparticles, the ADM particles are nonannihilating or, at most, feebly annihilating. As a result of the low annihilation rate, it would be nearly impossible to detect ADM through the indirect methods commonly used for searching for annihilating dark matter candidates. However, when ADM particles accumulate in stars, the particles can weakly interact with the star matters nuclei, producing an additional energy transport mechanism in the stars core. Previous theoretical studies have shown that this mechanism can modify the density and temperature of the star, which can provide a way to indirectly detect ADM. Here, the scientists have taken the next step and applied this strategy to main sequence stars in environments with high ADM densities. Main sequence stars have a specific relationship between their temperature (or color) and brightness, which is illustrated on a HertzsprungRussell (HR) diagram. In general, the hotter a star, the brighter it is. However, when a main sequence star contains ADM, it deviates from the standard path in the HR diagram in two possible ways, depending on the ADM density. At low densities, the ADM-driven energy transport mechanism makes the star brighter (and bigger) in relation to its temperature, moving the star above the standard path. At high densities, the same mechanism makes the star colder (and smaller) in relation to its luminosity, moving it to the right of the standard path. As the researchers explain, these deviations result from a complex interaction between the ADM and the star, which begins when ADM particles scatter off the star matters nuclei. Because the larger ADM particles can travel further than the nuclei, the dark matter transports the heat energy generated by these interactions out of the stars core, resulting in a sink of energy in the core. At low ADM densities, the stars nuclear energy generation is reduced in the very center of the core, and the star tries to compensate by increasing nuclear energy production outside the core. The increased nuclear reaction rate allows the star to achieve a new equilibrium, but it also makes the star bigger and brighter. At high ADM densities, the dark matter reduces nuclear generation in the entire nuclear core. The overwhelmed star contracts, becoming smaller and colder. The scientists calculated that the effects should be greatest for stars with masses around that of our Sun or a little lower. This is good news, considering 60% of the stellar mass in the Milky Way is expected to exist in the range of 0.1 to 1.0 solar masses. The bad news, on the other hand, is that these stars must reside in environments with an ADM density of at least 100 GeV/cm3, which is about 200 times higher than the estimated 0.4 GeV/cm3 density that exists near our Sun. Large amounts of dark matter are thought to exist in the center of the Milky Way and in the centers of nearby dwarf galaxies. The researchers caution that the chances of clearly observing stars in these distant environments could be difficult. Current observational techniques of stars at these distances involve large uncertainties of the stars temperatures and luminosities, so their placement on the HR diagram would be somewhat unclear. However, the scientists also note that its possible that stars could capture ADM in an environment rich with dark matter, and then migrate somewhere else in the galaxy, perhaps closer to us. In this case, the scientists predict that the effects of dark matter would still be visible and more easily detectable. are there any observations of 'feebly annihilating' or 'non-annihilating' particle/anti-particle pairs in an actual lab somewhere? LHC? Or are they being invoked to solve problems in the regular WIMP model? Neither. It's just a hypothesis which may offer another avenue for pinning down the nature of DM. However, I think this particular proposal is a bit of a stretch, but it doesn't hurt to give it a go. Since dark matter is gravitational it should aggregate. There is a way to differentiate large dark matter bodies from black holes. Although they would both cause gravitational lensing, black holes, being point sources, would have a steeper Gradient of lensing. In fact, a point source should have a theoretical lower limit of lensing. Any lensing with a gradient below this would be from a dark matter body rather than a black hole. There is a way to differentiate large dark matter bodies from black holes. Although they would both cause gravitational lensing, black holes, being point sources, would have a steeper Gradient of lensing. In fact, a point source should have a theoretical lower limit of lensing. Any lensing with a gradient below this would be from a dark matter body rather than a black hole. Dark matter is summed up very well as "unexplained gravitational effects." It is not summed up very well as "matter whose properties preclude it from ever falling into a black hole, or by itself forming a black hole." If your objective is to rule out steep-gradient gravitational lensing objects as dark matter, thus making it easier to spot "real" dark matter gravity sources, it's a fail. We don't know enough about dark matter to do that. We're *just* starting to guess at how dark matter might affect main sequence stars. We haven't even started in on black holes. It seems this hypothesis makes a LOT of assumtions about the nature of dark matter particles without justification. We know a lot about what dark matter *cannot* do (ionize at cosmically available temperatures), but little about what it can do ('feebly annihilate'?) beyond gravitational attraction. We do not even know if there is an anti-matter counterpart to dark matter. Constraining DM is the light of some astronomers life. Kudos to them! You don't know what you are commenting on. Chances are getting _lower_ for anything else, in part because you can make the constraint work that the article speaks about. If you couldn't, it wouldn't be a viable theory. And realistically, there is no longer any chance that general relativity is in error or that it will be modified in place of DM. Against errors, the standard cosmology with DM predicts GR out to large distances and precision. Against modifications, the recent Eris simulation of a spiral galaxy, a first, _needed_ DM to do it. The last hold out of MOND got clobbered, and there are no longer any gaps in which to stick alternative theories. As Deesky already said, a model attempted to constrain DM. No better, no worse. @Tobjorn: Dont mistake the failure of MOND for the success of DM. There still are a lot of problems with DM since it must simultaneously satisfy a lot of conditions. The only reason this model 'works' is that they have hypothesised a completely unobserved pheonomena i.e weak particle/anti-particle annihilation. Without that the WIMP model doesnt work, as either we would be observing stars behaving oddly (i.e. more common supernova) as DM accumulated in their hearts (if WIMPS dont self anihilate) or evidence of annihilation in the Bullet Cluster and other colliding galaxies. This is just the latest cludge for the WIMP model. Cosmology Vedas Interlinks -set the Wisdom mode. Initial set mode to Dark-mode theories is within 1000 Ly or even much less. The Dynamic function takes over above these limits.